Art galleries exhibit and sell art. The art may be original or a print of the original painting. Art gallery owners may sell a wide variety of art styles in watercolor, oil, or acrylic. This type of gallery is usually a commercial enterprise that is open to the public, and they have access to many buyers. Galleries may be artist-run or artist-cooperative spaces. They are often clustered in large cities where there is a lot of foot traffic, but some small towns do have galleries as well. Indeed, some towns are considered art towns because so many artists live, work, vacation, or retire to, the same area. 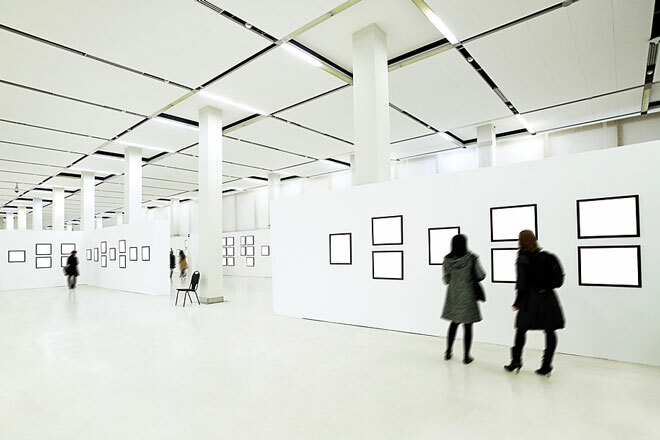 Some artists like to be represented by an art gallery. Private or contemporary galleries work with artists on a commission basis. This usually requires signing an agreement or contract between the artist and the gallery. The gallery may select an artist based on their need for a collection of work that embodies a certain style, or the gallery may have a distinct mood and atmosphere that appeals to a certain type of buyer. They may choose to arrange for the matting and framing of the artwork they sell. Rather than taking work from new artists, many private galleries only want to promote well-known artists whose work is easiest to sell. Vanity galleries charge artists a fee to exhibit their work. There may be a membership fee or a charge to arrange an exhibition. Vanity galleries are not generally as selective in what artwork they exhibit, because they are paid by the artist rather than receiving a commission for sold paintings. Visitors, collectors, interior designers: anyone with an eye for fine art will find a wide range of talents, subjects, styles, and mediums as broad as the Blue Ridge, at prices to accommodate every budget. Portraits and site-specific or general commissions are also available. Features work from local artists. Maryland's Eastern Shore. Nine towns. Fine art and craft from local, regional and out-of-state artists. Artist operated gallery. Local artists. Modern art and Contemporary art supplier in UK offers modern oil paintings like British paintings, American paintings, European paintings, watercolour paintings, expressionist painting, abstract painting, cubist painting, etc. Contemporary oil paintings and art collection in UK. Working artists' studio and gallery space. Local artists. Art Gallery in Lubbock Texas that features local painters.